The Tree Of Life Agave Nectar is a tasty addition to your foods and drinks. This Nectar Sweetener comes in a 23.5 oz squeezable bottle with a nozzle that will allow you to drizzle the right amount every time. This Light Nectar contains no preservatives or additives and is a certified USDA organic product, making it ideal for the health conscious to use. Because agave nectar has a low glycemic index, it will make a convenient alternative if you need to watch your blood sugar levels. It is sweeter than refined sugar, which means that you do not have to use as much to sweeten your drinks or food. 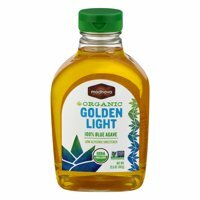 This Light Nectar features a mild flavor that will complement a variety of foods and drinks including teas, coffee, pancakes, muffins, biscuits and much more. Unlike other sweeteners, agave nectar will not crystallize if it is left on your shelf for several months. Tree Of Life Agave Nectar is an ideal alternative if you would like to eliminate refined sugar from your diet. Easy Squeeze. For cooking and baking. Madhava Organic Agave Nectar comes from the Weber Blue Agave plant and offers a delicious, all-purpose alternative to processed sweeteners. Its low-glycemic and 1.4 times sweeter than sugar, so you can use less and save calories. Enjoy in your favorite recipes, beverages and anywhere you would use sugar. Pepperidge Farm Goldfish Pizza Flavor.Baked snack crackers.Baked with real cheese. Blue Diamond Almonds Almond Breeze Unsweetened Original Almondmilk is free of dairy, soy, lactose, cholesterol, peanuts, casein, gluten, eggs, saturated fat and MSG. All natural with added vitamins and minerals, it has 50% more calcium than milk. Blue Diamond Almonds Almond Breeze is made in a peanut-free facility. BelVita Banana Bread Soft Baked Breakfast Biscuits.New!Nabisco.20% daily value of fiber.7g fat per serving.Breakfast.Nutritious morning energy.Natural flavor with other natural flavor.5 x 1.76 oz (50g) packs. Crispy flakes, crunchy oats & a touch of honey! Diets low in saturated fat and cholesterol, and as low as possible in trans fat, may reduce the risk of heart disease. Nutrition Benefits: Heart Healthy: 0 g trans fat; 0 g saturated fat; 0 mg cholesterol per serving. From concentrate. No artificial colors, flavors or preservatives. 25% less sugar than other leading juice drinks. With no artificial sweeteners. Sensible Solution: reduces sugar; good source of vitamin E. No high fructose corn syrup. The great taste kids love. All the great taste! 10% fruit juice. This product 18 g sugars; other leading juice drinks with no artificial sweeteners 25 g sugars per 6.75 fl oz serving. Everything came timely. We were notified when it had been delivered.